2014-12-20: California, and NOT Dreaming! Sitting with Heather in a fast-food restaurant in North Dakota, USA, I was using my smartphone to look for a motel. “Here’s one,” I said. “It has wireless Internet in the room, and the price is right.” I named an economical room rate, conveniently quoted to us in Canadian dollars. “Sounds good to me,” said Heather, “book it!” A few clicks later and we had a confirmed prepaid room waiting for us in Watertown, South Dakota, 230 kilometres away. Travelling on a high-speed highway, we figured we could be there in slightly over two hours. It was only 5:00 PM, but December days are short, and darkness was falling. I don’t like night driving, particularly in winter, but we wanted to get as far as possible in this day’s drive, and two hours of night driving on an American “Interstate” did not seem too much of a burden. We finished our meal and made our way out onto the highway. Before long it was pitch dark. Our headlights illuminated the road surface in front of us, and the lane markings were visible enough that we were able to drive at the posted speed limit. Sometimes we would overtake a huge commercial truck lumbering along almost as quickly as we were. Sometimes we ourselves would be passed by a much more quickly moving vehicle, whose taillights would soon disappear into the darkness ahead. Suddenly a gust of wind buffeted the car, and the road in front of us disappeared in a swirling cloud. Snow! Was the wind picking up surface snow from the vast farm fields on either side of us? Another cloud of dense snow blew over the car. No, this was a snowstorm. If it had been daylight, we probably would have seen it coming – a wall of blackness and swirling snow drawing ever nearer – but in the dark, we didn’t know about it until it was upon us. Slow down! Who knows what that white stuff is concealing on the road ahead! I began to feel the wheels of the car bump over drifts on the highway. This was not a simple snow squall. We seemed to have entered a major storm. Then the engine raced, and the car swerved slightly – ice! Ice on the road, under the snow! I took my foot off the gas. The adage, “Steer in the direction of the skid!” is almost an instinct with me, and without thinking I pointed the front wheels in the direction we were sliding. The car straightened, and I slowed the car some more. Do NOT use the brakes, just keep the foot off the gas until we are going at a safe speed. Proceeding carefully, I peered into the darkness, vigilant for stalled or disabled cars in my path. Eventually I could see, between gusts of snow, the twinkle of tail-lights ahead. I began to catch up with a number of cars and trucks moving slowly through the blizzard, and I fell in behind them, glad that they were there to help lead me through the darkness. I put my emergency flashers on, to warn any vehicle coming up behind me of our presence. Sure enough, I soon glimpsed headlights in my rear view mirror, and then we were no longer the last car in the procession. What on earth, you may ask, were we doing driving so far from home in such hazardous conditions? The answer? We were headed to California for Christmas, to be with our newlywed daughter, Rachael, and her husband, and his family, for the holiday. We were driving rather than flying because Heather and I like driving together, and we figured we could handle a winter journey. 1 Also, we had a carload of stuff to take to Rachael – mostly keepsakes from her childhood, plus some dishes and housewares, that we have been storing for her – which would have been impossible to take with us, had we been travelling by air. The journey we set out on would cover 4,112 kilometres (2,555 miles) and take five days. We had expected – and were prepared for – winter-related delays in the early part of the trip, but when this blizzard hit us at night, after we had driven much of the day on dry pavement with great visibility, we were taken somewhat off guard. Should we turn back? We had already gone quite a distance since supper, and, presuming we could even find a place to turn around on this highway, we would have quite a distance to travel in the wrong direction – in equally bad conditions – and lose a lot of time in our journey. Besides, that room in Watertown, still at least one hour down the road from us, had already been booked and paid for! So we continued, on high alert, in terrible visibility, with wheels often skidding on ice. Mostly we travelled in procession, but one or another of the cars ahead would exit the highway, obviously getting near to their destination, until we would find ourselves either as the front vehicle of the procession, or utterly alone, driving through the darkness. It was one of the more harrowing experiences of our lives. Eventually, signs appearing through the flying snow indicated that we were nearing Watertown. Our exit came into view, and soon we were driving along a street covered in deep snow, in the town. We made it to our motel, heaving an enormous sigh of relief, and settled in for the night. The next morning, when I was gassing up the car, I asked the attendant how quick the authorities might be in getting out on the highway to plow and lay down sand and salt. He said that when he came to work at 5:00 AM, he saw snowplows on their way out. “The highway should be okay by now,” he said. It was. We saw trucks at work in the opposite lane, and lumps of salt and grit on our own road surface. On our icy road surface. As we drove, it became very clear that what had been a blizzard further North, where we had driven the night before, had been, on the portion where we were now, more rain than snow – rain that had turned to ice as soon as it hit the pavement. Before the trucks came with their salt, the highway would have been a veritable skating rink. We saw cars down in the ditch beside the road, ice-covered, and abandoned. Heather and I marvelled at our good fortune to have ended the previous night’s drive when we did. In that darkness we ourselves would surely have slid sideways into the same ditch, and if not, we would have arrived in the next city stark staring mad. Despite the work of the sanding trucks, driving was still difficult, and, with the exception of a few individuals, those who were on the Interstate with us kept to a very cautious 80 km/h for a very long way. Though I could seldom take my eyes off the road, I saw enough of the scenery through which we passed to say that it was beautiful beyond belief. The sun shone brilliantly, and trees, grass, field stubble, and highway posts, all uniformly coated with a layer of ice, glittered like a crystal fairyland. It was glorious and unforgettable. Gradually the road became dryer – though we continued to encounter icy spots from time to time. Then, when road surfaces became completly clear and grippy, driving became fun once more. The rest of the day’s drive (853 km.) was quite relaxed – though never again as visually beautiful as that crystal world through which we passed in the morning. A most notable thing was the gradual outdoor temperature change – from minus 10°C in Winnipeg to plus 1°C in Kansas – largely, I figure, the result of driving 1,400 km. straight south. Sunset, which in Winnipeg came at around 4:30 PM, now occurred at 5:15 PM. A fascinating experience. Yesterday we arrived at Rachael and Michael’s home in California, which is where I am as I write this. I could tell you more tales about the journey, but although the scenery was spectactular, and the touristy things that we did were fun, there was nothing quite as dramatic as that night-time blizzard and the next morning’s slippery drive through an ice-covered wonderland. It is good to be here. Not only do we thoroughly enjoy being with Rachael and Michael, Heather is ecstatic to be so far away from the cold of winter. 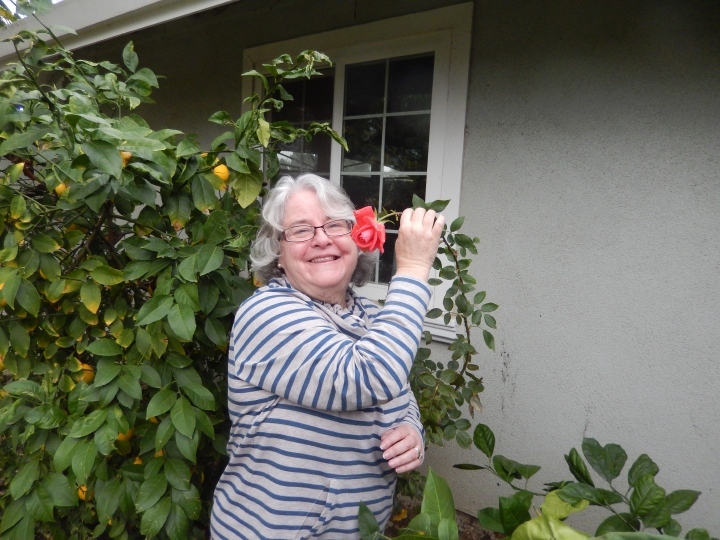 She marvels at the roses and oranges and lemons growing by the front walk, and delights in never having to put on a thick parka before going outside. Soon we shall drive to Michael’s parents’ home and celebrate Christmas Eve and Christmas Day with them. Eventually there will be the return to Winnipeg, and who knows what adventures that will bring!? There may yet be more tales to tell! When I sat down to write this update I began to realize that there are two equal and opposite reasons why I can go a long time without posting anything in this blog: either nothing interesting is happening, or too much is happening! ... until early December, when things suddenly got quite exciting. We saw a three bedroom apartment advertised for rent. Ever since Heather closed her office we had thought we would be better off with the extra space of an additonal room, so we went to see the place, loved it, and decided to move. A date was set for mid-January; a lease was signed, and movers were hired. Then, just before we set out on this trip to California, we measured the new apartment carefully, and found that almost nothing that we currently own would fit. The place had been completely renovated, but closets would need to be re-done in order to accept our “organizers,” we couldn’t put our glass-fronted bookshelves anywhere because of the position of walls and windows and doors, and the beautiful and brand-new kitchen cupboards were not deep enough to hold our regular set of dishes! And this is only a partial list of the problems we would experience if we made the move. We were thunderstruck. We realized that we had made a serious mistake. Three-bedroom apartments are extremely scarce, and many people desire them, so fearing that we would not get this one without acting quickly, we had jumped before looking too closely. Fortunately we were allowed to tear up the lease – though we lost our deposit – and the Winnipeg Moving people 2 kindly refunded half of the deposit that we had paid to them. It was a stressful time and an expensive lesson learned, but in the process we have appreciated more and more the place where we currently live, our neighbours, and our neighbourhood. And now we’re on this extraordinary winter trip to California. When we return to Winnipeg, things won’t exactly calm down, either. 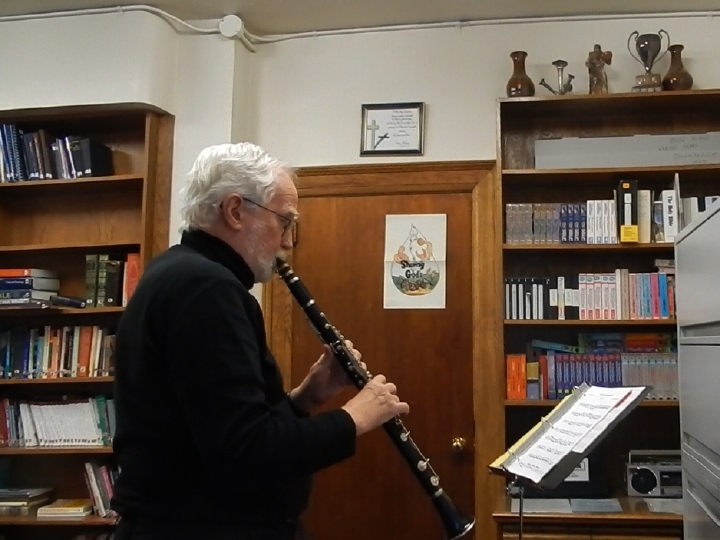 For example, I’m going to play my clarinet with my friend Russ Greene once again, 3 in a public performance. There will be some Tchaikovsky, some Schubert, some modern classical compositions, and some Benny Goodman-style jazz. We’ll even have a distinguished guest soloist: Rachael will come to Winnipeg for this, and will perform Schubert’s Der Hirt auf dem Felsen – a piece written for soprano, clarinet and piano. If you’re in or near Winnipeg, mark your calendar for Sunday, February 8, in the afternoon, at St. Andrew’s Anglican Church, 2700 Portage Avenue in Winnipeg. Needless to say I have been practicing like a mad person for this event. In fact, I’m renting a room in a nearby church – so as not to disturb my neighbours at the apartment – and was practicing there an hour a day, until we left for California. And I shall resume that daily discipline once we have returned home. After the concert, Heather and I are going to leave winter behind for a second time this season! We have arranged to rent an apartment for three weeks in the West Indian island of Grenada. Will I be able to write up any of these adventures? I hope so, but at this point I can make no promises. 1 See the entry called “A Winter’s Trail,” which tells of our drive from Winnipeg to British Columbia and back, in November, 2013. 2 “Nathan,” from Winnipeg Moving (an Allied Val Lines affiliate) was so understanding and helpful that I am happy to endorse both him and his firm. 3 See my blog entry, “Watching a Dancing Bear?” from October, 2008.